Figure 4.44. Sketch of variable cycle ramjet based on Rocketdyne SSME, circa 1983. Rotating gas i generator ! exchanges between the air and fuel. We might find a complete new spectrum of such engines awaiting our discovery. Such engines were discovered and unfortunately never pursued. 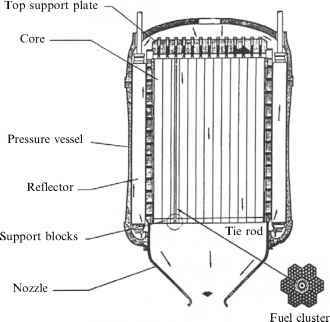 In Figure 4.44 there is a thumbnail insert of an original sketch of a variable cycle turboramjet based on the Rocketdyne SSME sketched sometime in the early 1980s. Unfortunately the identity of the sketch's source has long been lost. But it shows the ingenuity that was routinely discarded in favor of the rocket status quo. 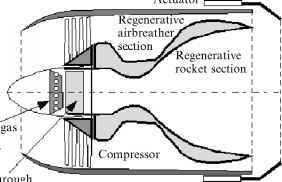 Although the details of the engine's operation are also lost, the originality in adapting an existing fixed cycle rocket engine with a fixed specific impulse to a variable cycle, airbreathing turboramjet/rocket is evident. As shown in the enlarged drawing based on the sketch, a rotating gas generator provided the power for the low-pressure ratio compressor. The engine operated as rocket-based turboramjet at lower Mach numbers and then could transition to a conventional rocket for the higher Mach numbers. With the flow through a LOX injector, if the airbreather thrust could not provide sufficient low speed acceleration, the rocket could be ignited to provide an additional boost. Who knows what the launchers of today would be like if innovations like this, based on current operational hardware, had been allowed to proceed. It is not a lack or ideas or hardware concepts, or the lack of technology that confines us to low-performing rockets today, but a lack of imaginative and decisive leadership to implement those ideas.